Washington County has swung to the Bell and Everett Constitution Union ticket by a small majority. In one respect, the election in the county is similar to the national results. Division of the Democrats into Northern and Southern wings lost the election to that party. The vote here for Bell was 2,567, for Breckinridge 2,475, for Douglas 283, and for Lincoln 95. While Bell has a plurality, the combined Democratic vote of Douglas and Breckinridge, the two Democrats, is greater than the combined vote of Bell and Lincoln. The President-elect of the United States received about the same number of votes as a member of some “lunatic fringe” group, such as, say, a believer in women’s suffrage, might have received. In the Sharpsburg, Sandy Hook and Indian Springs, districts, he received but a single vote in each; in Clear Spring, Hancock, Pleasant Valley, Funkstown and Conococheague, but two votes each; in Williamsport, 15; Hagerstown, 12; Boonsboro, 14; Cavetown, 13; Ringgold, 18. But the vote for Breckinridge does not necessarily indicate the majority here are in favor of secession now that he has been defeated, as is evidently the case in South Carolina. This campaign has been dull and apathetic, compared to many which have preceded it. There has been not nearly the excitement that occurred in 1858 when the Know-Nothing Party, opposing foreigners and Catholics, carried the state of Maryland including most elective offices in Washington County. Within four years, this party, which received one-fifth of the popular vote in 1856, though it carried only Maryland, has utterly disappeared. A referendum, proposing enslavement of all Free Negroes in Maryland, was overwhelmingly defeated throughout Maryland. 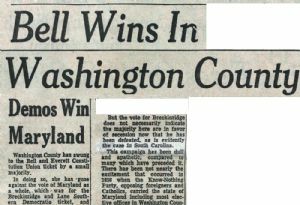 The Hagerstown Mail favored the election of Breckinridge. The Herald and Torchlight supported Bell and Everett. Francis Thompson spoke in Hagerstown, supposedly in favor of Douglas, but actually, according to those who heard him, more in favor of Bell. Although a Democrat, he has been at odds with party officials, and ran for Congress as an independent. J. Dixon Roman, a life-long Whig, also supported the Bell ticket. He was emphatic in his condemnation of the doctrine of secession, and went so far as to say he would prefer the election of Lincoln to Breckinridge. In this, he did not represent Washington County. Most of our citizens regard the election of Lincoln as a national calamity, and look upon the future with dismay.